Step 1- Apply via UNL Education Abroad "MyWorld": https://myworld.unl.edu/index.cfm?FuseAction=Programs.ViewProgram&Program_ID=10008 This process includes medical history and academic information. You will be required to send a deposit to secure your position in the field school. The first part is a pre-application Research Visa form that needs to be filled out, signed and submitted. This form is available from Prof. Hoff. He will send via email upon request. In addition to the Form, also please submit a passport-type photo (minimum 300 dpi) to Prof. Hoff. Send the form to Prof. Michael Hoff (mailto:mhoff1@unl.edu). Online-application: This part occurs once the permit has been accepted and signed by the authorities in Turkey, usually in May. Participants will be given instructions how to complete the application and how to send payment for the visa fee (currently $125). Residence in Project excavation house near the city center of Gazipaşa. Each room will have two to possibly six beds. Academic credit is optional. 3 to 6 hours offered through the University of Nebraska–Lincoln. Antiochia ad Cragum is located in the village of Güney, approximately 20 km southeast of Gazipaşa, where the project headquarters are located and where participants stay. Gazipaşa lies 40 km southwest of the resort city of Alanya. Transportation to Gazipaşa from Istanbul is is made easy by direct daily flights. We are continuing the clearing of the Great Bath, having already completed work in the frigidarium. Currently we are working in the tepidarium in which we have so far discovered several late Roman ceramic kilns that were installed after the original function of the bath ceased in fourth century. The discovery of the kilns sheds light on the transformation of the Great Bath into a light industrial complex in the Late Roman period. In 2019 we will complete the clearing of the Bouleuterion. In 2018 we began to clear the outer wall of the structure to define its entrance and how the structure relates to the adjacent Great Bath. We began the clearing of the Small Bath located outside the city’s Main Gate in 2018 and our first trenches revealed an early modern treasure horde (17th century silver and gold) and a mosaic pavement. We plan to continue the excavation, revealing one more of the frigidarium chambers. We suspect that all the chambers of the Small Bath are paved in mosaics. We are continuing the exploration of a small complex atop the high point of the ancient city. 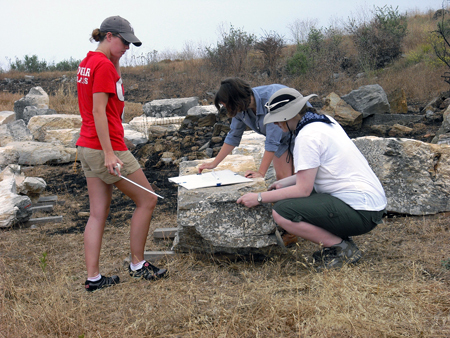 We have been able to identify early Christian structures (churches and baptismal font) that suggest the complex may have been a monastic community. 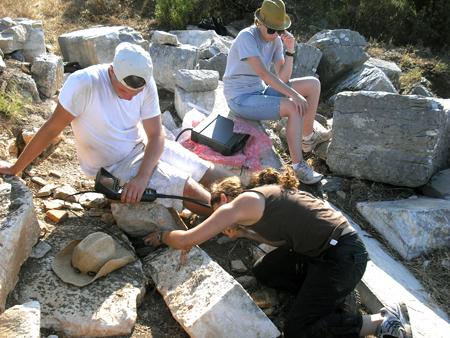 The excavation runs on a Monday-Friday schedule. We depart for the site at 5:30 AM and enjoy a group breakfast at the site. Work begins at 6:30 and continues until 1 PM. There is mid-morning break at 10:00. Lunch is served at 1:00 at our excavation headquarters. Usually we return to Gazipasa after lunch where participants engage in ceramic studies (washing, drawing, analysis) or mini-seminars. On Fridays, there is a site tour and swimming in the nearby “pirate cove.” Dinner is provided in the Gazipaşa Excavation House at approximately 7:00 PM. All meals, prepared by local cooks, are typical Turkish fare with an accent on fresh and homemade foods. No meals are provided on Sundays and Saturday breakfasts. 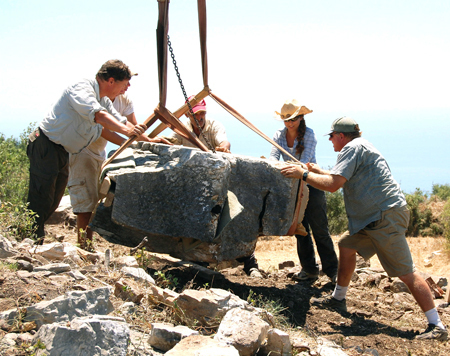 Following documentation, blocks are carefully moved. Fiberscopic Remote Inspection equipment, utilizing a boroscope, is used to investigate clues to the original structural and architectural design of the temple as well as its current condition. Excavations have been carried out on the temple mound since 2009.